VanDyck Indian gin & tonic. Cucumbers, roses and vanilla, and no flavors that make curious. VanDyck gin is soft and fresh flavor. Together with the accompanying Indian Fever Tree tonic, cucumber opener and this is the perfect gift. VanDyck gin is gin from Dutch soil. What makes it unique is the taste of cucumber and rose. Together with nine spices VanDyck the gin is distilled. The herbs and vegetables used Therefor, are juniper, cardamom, coriander, angelica, vanilla, lemon, orange, licorice and iris root. The gin is soft and fresh. Mixed with the Indian Fever Tree tonic is to create the perfect, refreshing gin and tonic cocktail. Garnish with cucumber will really surprise in taste. 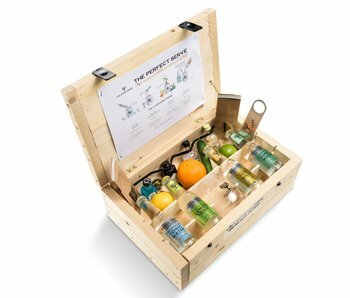 The package includes a bottle of gin VanDyck or 0,05 liters. Together with the bottle opener and the tonic for use. VanDyck & Indian tonic is a great birthday gift, a nice gift or perfect for someone who wants to try once gin and tonic. In Addition to the included cucumber, VanDyck tastes like gin with Fever Tree Indian Tonic well with lime or orange. The recipe for a VanDyck gin and tonic cocktail. 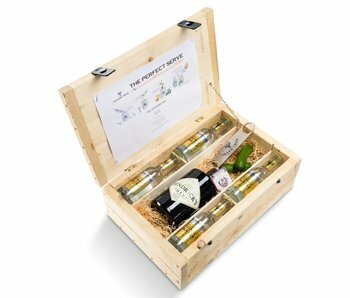 Our original business gifts come in a beautifully finished luxury wooden box. An instruction for making the perfect gin and tonic is of course included. The recipe for a successful and original gift.